AT3 Complete Upper assemblies are Built for Accuracy and Reliability – Guaranteed. Quality Where it Counts – premium components like Ballistic Advantage barrels, and AT3 Tactical’s handguards and uppers. Don’t settle for “bargain uppers” with unknown components. Unbeatable Value – Unbeatable quality in the price range. Save up to 20% off vs purchasing the components separately. Get your new upper complete with the barrel you want! The 10.5″ Anderson Manufacturing barrel is highly affordable, featuring a rugged, parkerized finish. 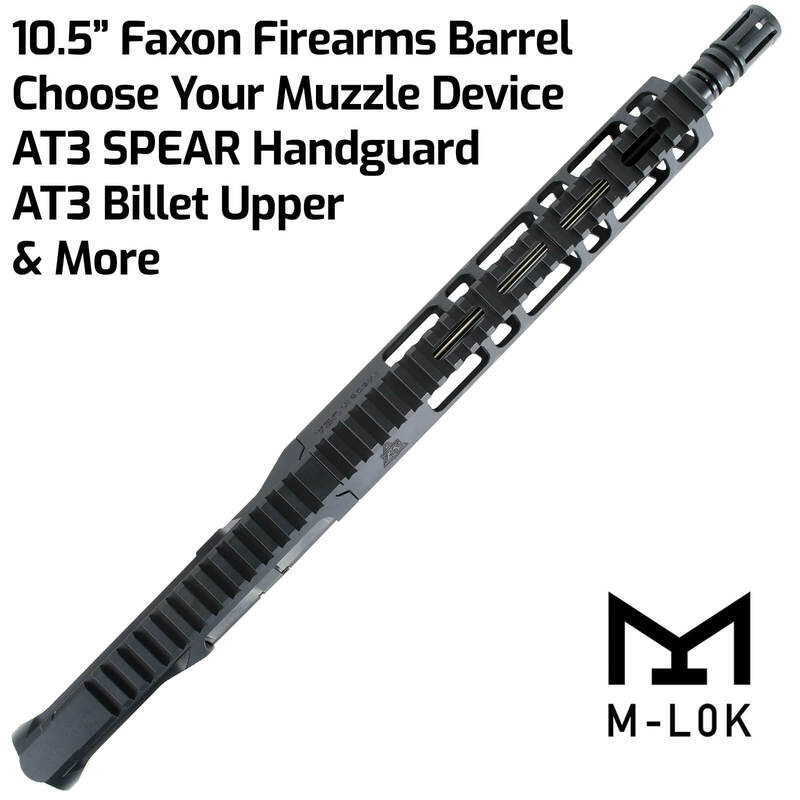 Faxon Firearms’ 10.5″ barrel is geared towards high performance, featuring great accuracy with a variety of 5.56 bullet weights, and a corrosion-resistant QPQ finish. You can learn more about these two great products with the links below. Precision machined from 6061-T6 aluminum, this assembled upper is sleek, with extra material around the barrel extension for superior accuracy. It mates perfectly with our SPEAR handguard and feature M4 feedramps for reliable feeding of ammunition. AT3 Tactical partnered with the best BCG manufacturer in the industry – Toolcraft Inc – to produce these Top-Tier Bolt Carrier Groups. They feature M16-style carriers, MPI/HPT inspected bolts, and properly staked grade 8 gas key screws. Quality 7075-T6 charging handles – choose between standard latch and extended latch designs. This product is built-to-order in our Minnesota facility. Quality takes time – please allow up to 7 days for your order to ship. All AT3 upper assemblies come with a Lifetime Warranty – if you ever have an issue, let us know, and we’ll make it right. It’s that simple. Don’t see the options you’re looking for? Let us quote you a custom upper – contact us now. 3 reasons why AT3 Complete Uppers are better than the rest. The single most important component of an accurate AR-15 is the barrel. AT3 uppers are built using Ballistic Advantage barrels with a Sub-MOA Accuracy Guarantee. But the quality doesn’t stop at the barrel. Our AT3 handguard and upper work together to provide superior accuracy, meaning this upper assembly offers quality without compromises. Many of the “bargain” complete uppers on the market source their parts from the lowest bidder – at the expense of accuracy and reliable function. AT3 is committed to using only top-quality components in our upper assemblies. AT3 complete uppers are assembled with strict quality controls and carefully packaged for delivery to the customer. All AT3 complete uppers offer a Lifetime Warranty – if you ever have an issue, let us know, and we’ll make it right. It’s that simple. When you buy a complete upper, you’ll save up to 20% off vs purchasing the components separately. Our complete uppers are not the cheapest on the market, but they deliver unbeatable quality in the price range. We sell direct to the customer, and cut out the middle-men, to deliver the best value in AR-15 upper assemblies.